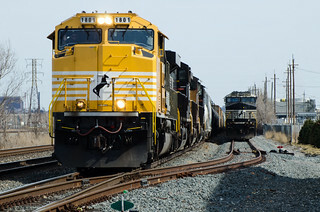 Many of the NS standard cab SD70's are in the process of being rebuilt into SD70ACU's. The 1800 and 1801 have received a yellow and gray paint scheme. With a big wave from the engineer, here we have the 1801 heading up train 17N (Bellevue, OH to Bedford Park, IL, BRC Clearing Yard, manifest) rolling into downtown Whiting, Indiana on NS' ex-LS&MS/NYC/PC/CR Chicago Line, passing by a slab train that's tied down in a brand new siding. NS SD70ACU 1801 began life as NS SD70 2548 in September of 1994.